Today at school was school picture day. Always part of the back to school ritual here in the US. 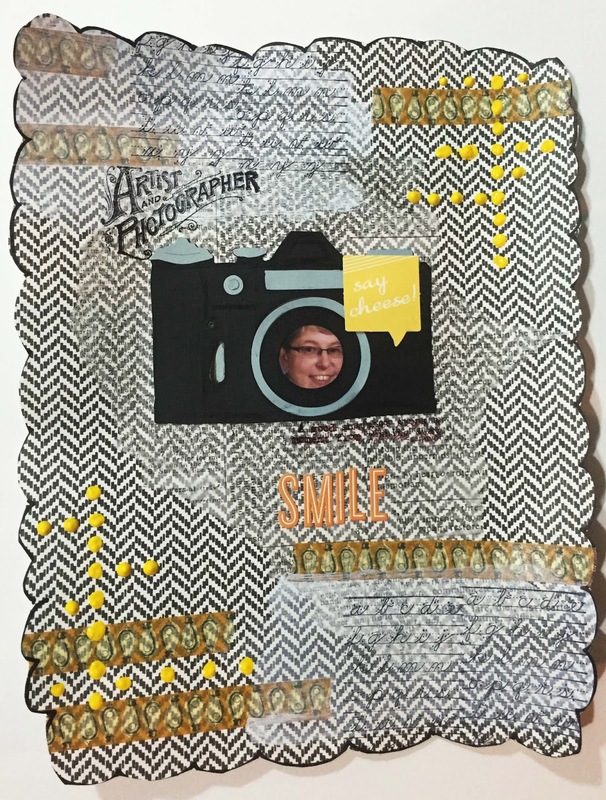 So today' journal page is all about picture day. I thought it would be a good idea for this month's Back to School theme at Art Journal Journey. Thanks Elizabeth for hostessing and having such a good idea. And although the edge of my page aren't perfectly even, the fact my paper had a bit of curl when I photographed it makes my page look like I can't tell a straight line, so that the right side is shorter than the left. And nope, that's not how it is. I also learned that this black and white background paper doesn't allow the camera to pickup the details which show up better when you look at the actual page. And that face in the center of the camera is me in an old school picture from 2009. Yes, even us teachers need our pictures taken so we can have ids too. Now school pictures are taken early so school people, staff and students, can get ID's. All our school photos get put onto the school computer system. After some horrible school shootings in the near past, the innocence of high school days has really changed. One of those changes is that there is a lot of school security changes, and one of those changes is all these school IDs and being able to identify who is who in the building. That's why we get our photos taken so early in the year. So today we had some misty rain for the day. Not enough rain, but still rain, as we are in a drought. Unusual as we live in a pretty wet area. But the weather people say we are about 15 inches behind what we usually get by this time of year. Anyhow, the gardens looks a little less droopy, but still plants and leaves are a little brown. I think the plants would love a week of real rain. Not much else new in my neck of the woods. So I leave you with this Robert Frost poem, this photo taken last Friday when I visited the Marsh-Billings-Rockefeller home in Woodstock, Vermont. 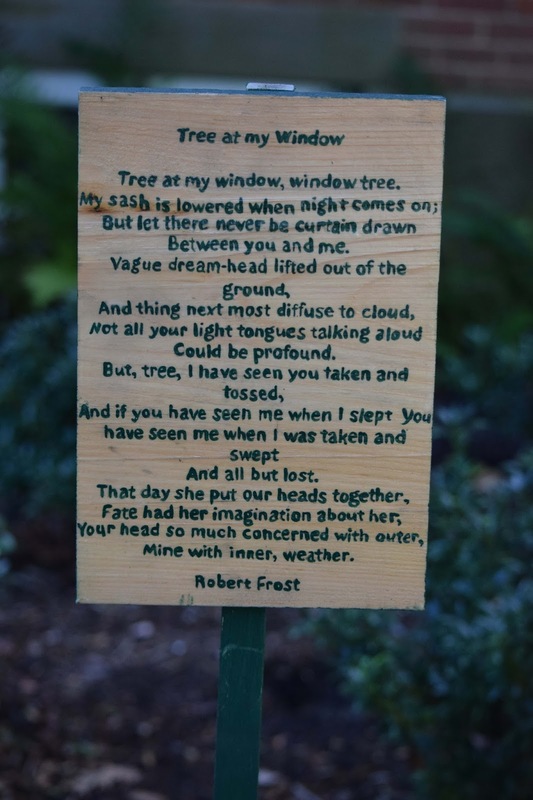 There were several different Robert Frost poems posted on the grounds. We had our school photos taken by a professional photographer who came in and took each person's photo for our yearbook. Seniors had their photos taken at their own expense and they were taken the summer between their junior and senior years. We got proofs, too. I had NO idea about the security procedures, but it makes sense. I really, really like your picture day entry for AJJ today. It's perfect! A fantastic idea - I love to see you Mrs. Erika! Thank you for another fab entry to AJJ! Off to Germany now - so excited! Love the idea that the poems are posted on the ground there! Cool! It's a super page using one of your own photos. We had a photographer come to the school once a year, the kids loved it the staff hated it. A lovely idea to have the poems posted in the ground, he is s super poet.